Apple has an exclusive connector for syncing and charging the new generation of iOS devices, known as the Lightning connector. It was first introduced in 2012 along with iPhone 5. But Lightning connectors have their own disadvantages. These cables tend to get damaged on moderately rough usage. Also, compared to the conventional Micro USB cables, Lightning cables have limited availability. And even if you get one nearby, it’ll be much more expensive than a Micro USB cable. Micro USB cable is used in numerous devices, and hence more commonly available compared to Lightning one, which is used only with Apple products (specifically the iPhone, iPad and iPod). So, if your Lightning cable suddenly stops working when you’re in an area with fairly less number of Apple users, chances are that you won’t find another Lightning cable nearby. At the same time, it’s much more probable that you can easily find a Micro USB cable from a neighbour or even from a local store. This article will try to provide a cost-effective alternative to charge your iPhone, iPad or iPod, in case your Lightning cable is not in operational condition. Many third party manufacturers build Lightning cables as alternatives to the official ones. When you walk into a store to buy a Lightning cable, you’d want to make sure that the cable is both supported and durable. We have previously covered an article about choosing supported Lightning cable. But picking a durable cable is usually more difficult. Here are some tips to make your Lightning connector last longer. Some third party manufacturers have come up with an innovative way to deal with the less-general availability of Lightning connectors. In this variation, the cable is actually made of two components: A conventional USB-Micro USB cable and a Micro USB-Lightning adapter that fits into the Micro USB end of the cable. You can find these two-in-one Lightning cables in some of the popular online stores (such as eBay) as well as few of the local retail stores. By picking the right type of cable, you’ll be able to completely get rid of the Lightning cable’s availability issue. Let us explore how this two-in-one design is particularly advantageous. Note: Some retailers sell two-in-one charging cables with a USB connector on one end with two separate cables (one for Micro USB pin, and another for Lightning pin) linked on the other end. Such cables are not a suitable replacement for a true Lightning cable, as this arrangement is useless once the cable is damaged. Alternatively, a Micro USB-Lightning adapter can work with any conventional Micro USB cable; thus damaged cables can easily be replaced. The use of this cable in the two-in-one design ensures that actual cable is widely available. To get maximize the durability of the cable, we recommend you select a flat, tangle-free cables as these are less vulnerable to breakage. This little interface makes it possible for you to convert any conventional Micro USB cable into a fully functional Lightning cable. The interface consists of a Lightning connector at one end and a Micro USB inlet at the other. The adapter is compact and cable-free, so it’s also less likely to get damaged. In case the Micro USB cable attached to the adapter is damaged, you can easily plug in any other Micro USB cable to it and continue to charge/sync your iPhone without much hassle. Also, a Micro USB cable costs much less compared to a Lightning cable, so you end up saving more on a charge & sync cable for your iPhone or iPad. Instead of a two-in-one Lightning connector, you may also opt for a separate Micro USB-Lightning adapter along with a Micro USB cable. In fact, Apple has officially launched the Micro USB-Lightning adapter (MD820ZM/A), so If you want to separately buy the adapter, it is recommended to get the official one from Apple. As for the Micro USB cable, you may go for any cable that comes from a reputed manufacturer and feels durable. From now on, if your charging cable stops working while you’re travelling, you may just ask for a Micro USB cable from your fellow travellers, and plug in the Micro USB-Lightning adapter to convert it to a Lightning cable. 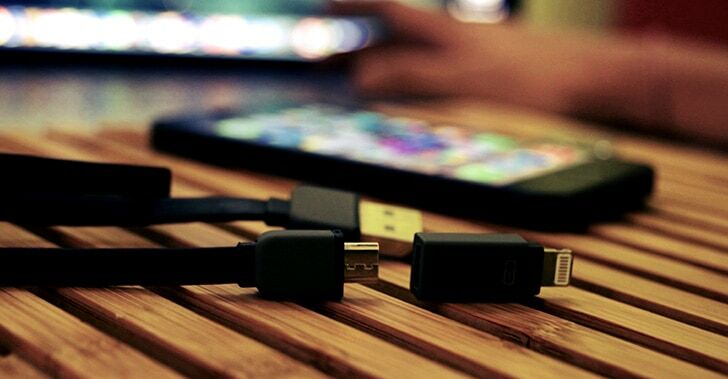 As Micro USB cable is more commonly available, more people would be able to help you.